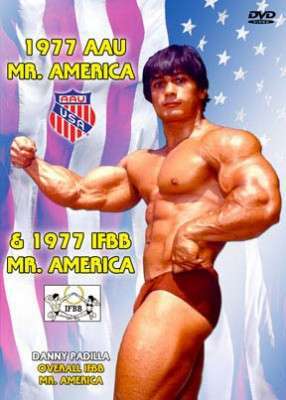 1977 AAU Mr. America – You will see the following stars: Andreas CAHLING, Dave JOHNS, Greg DeFERRO, Chuck WILLIAMS, a very young Lance DREHER, C.F. SMITH, Dave ROGERS and many many more. 1977 IFBB Mr. America – Mike SABLE, George NAVARETTE, Bronston AUSTIN, Dave MASTORAKIS, Len ARCHAMBAULT, Skip ROBINSON, John DEFENDIS, Steve DAVIS, Ray MENTZER, Dave DUPRÉ and the three class winners: DANNY PADILLA, ROGER CALLARD and PETE GRYMKOWSKI. July 17, 1977 Santa Monica Civic, CA. This version was shot by Wayne and we transferred his complete original film footage and used every part of it. The running time of this contest is 60 mins. This is the complete premium version in this DVD of the AAU Mr. America contest! See our PHOTO GALLERY. It covers both contests. June 18, 1977 Los Angeles, CA. What a wonderful catalogue of surprises we found when logging this video for inclusion in to the web site and no onto DVD. The list of competitors shown reads like a who’s who of Bodybuilding in 1977. Wayne shot this particular contest but even he didn’t remember the half of what we found! Mike SABLE, George NAVARETTE, Bronston AUSTIN, Dave MASTORAKIS, Len ARCHAMBAULT, Skip ROBINSON, John DEFENDIS, Steve DAVIS, Ray MENTZER, Dave DUPRÉ and the three class winners: DANNY PADILLA, ROGER CALLARD and PETE GRYMKOWSKI. Overall winner – DANNY PADILLA. A classic contest indeed – shot on silent film and transferred to video, now to DVD, with music added. Very good quality, given the technical standards of the day. All photos used on the cover are by Wayne Gallasch, copyright GMV Productions. *These RESULTS are not meant to infer that every person listed is seen in the DVD, as this was not possible.